Bunker (2008) is an example of exploration of the material. 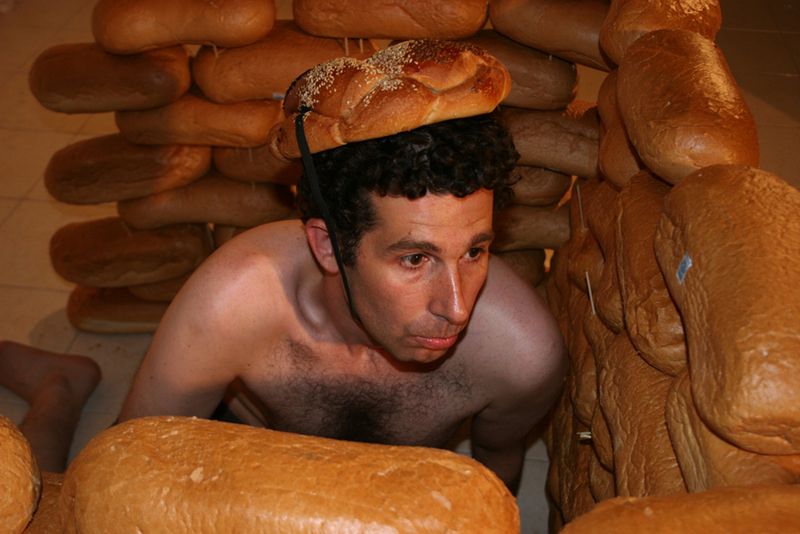 The artist built a bunker made out loaves of bread forming a 120 cm high barricade. In the bunker the artist hides in order to protect himself from pieces of bread being thrown at him. The work ironically exhibits the dramatic connection between bread and war: The piece refers to bread (food) and bunker (shelter) as the basic units which mankind needs to survive. Humanity goes to war over food and kills for those reasons, whereas bread is needed for life. War serves as human fuel and humanity feeds it back in an endless cannibalistic circle of predator and prey. The bunker that the artist built is be temporary and perishable, as opposed to the concrete bunkers that remain as monuments long after the fights are over.